In 1939 at the outbreak of war, Bletchley became the home of the Government Code and Cypher School, now GCHQ, which celebrates its centenary in 2019. Until the information became declassified in the mid-1970s, no one knew about the vital code-breaking work done at Bletchley Park during World War II - except those who did it. Ok, so perhaps arriving at Bletchley has changed somewhat since the days of World War II recruitment – but there’s still a thrilling buzz about the place. Just 40 minutes by train from London Euston, this unique and immersive museum allows you to follow in the criss-crossing footsteps of the 10,000 men and – overwhelmingly – women who kept the code-breaking machine working relentlessly through World War II. At the height of its operations, 3,000 people made their way off site every eight hours, as another 3,000 poured in to start their shift. The contributions of Bletchley are believed to have shortened the Second World War by two years – probably saving millions of lives. With that in mind, the harmless-looking cluster of Huts take on a much more impressive meaning. Entry to the Park is via Block C, which would have been alive with ticking analysis machines during WWII and now holds the Visitor Centre, where you will find an introductory exhibition, alongside information on the history of World War I and the future of cyber security. Those with a nose for info will want to pick up one of the interactive media guides and a wristband for one of the excellent free tours that take you round the site, explaining key information to get you started – but you didn’t hear that from me, alright? Hush, hush and all that. Once you’ve been briefed, each location quietly fizzes with the ghosts of its extraordinary history. Report to the mansion, where senior staff were based and much of the code-breaking operations went on earlier in the War, until the Huts were built. The Huts are where a lot of the ‘action’ took place, and though much less salubrious than the mansion, these humble buildings are not to be missed. In Hut 8 you will find Alan Turing’s office, and in Hut 11A you can learn all about the Bombe machine that Turing and others devised to help solve Enigma. From May 2019, a new, immersive exhibition reveals the full scale of Bletchley Park’s impact on the D-Day landing operations. This epic audio-visual experience will occupy the newly-restored Teleprinter Building, where hundreds of thousands of intercepted messages first arrived at Bletchley Park from secret listening posts across the UK, and beyond. It’s astonishing to think that this rich insight into history was nearly demolished in 1991, and could well have fallen down of its own accord, had the Bletchley Park Trust not intervened. So carefully guarded a secret that it almost slipped from memory entirely. This is more than just a monument to the events of World War II. Aside from its huge contributions to computing and technological innovation, Bletchley is also a bittersweet chapter in LGBTQ history – Alan Turing would subsequently be prosecuted for his sexuality, and there is a moving apology letter from then-Prime Minister Gordon Brown in Block B – and women’s history, as some 8,000 women were instrumental in the operations run at Bletchley Park, though their work was not publicly recognised until decades later. Bletchley Park is well worth a visit for those who know, or seek to know, more about this almost-forgotten but utterly compelling legacy. 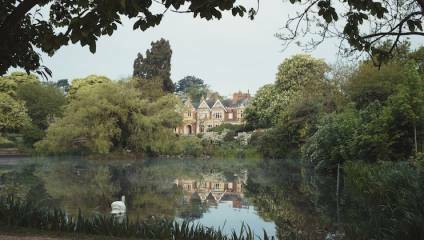 You can win tickets for a family day out at Bletchley Park by entering our competition!